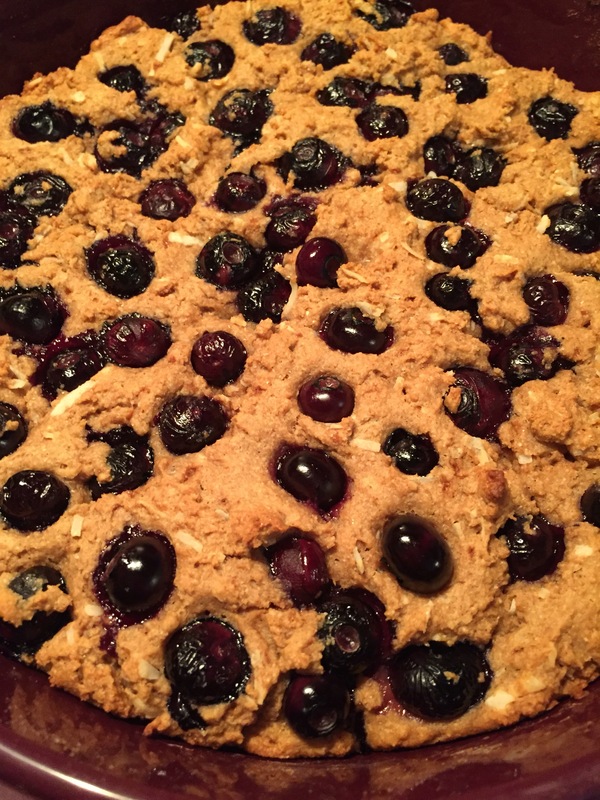 Blueberry Coffee Cake – A very pretty and slightly sweet snack with coffee or tea. If you like your sweets, super sweet, then add a bit more coconut palm sugar. 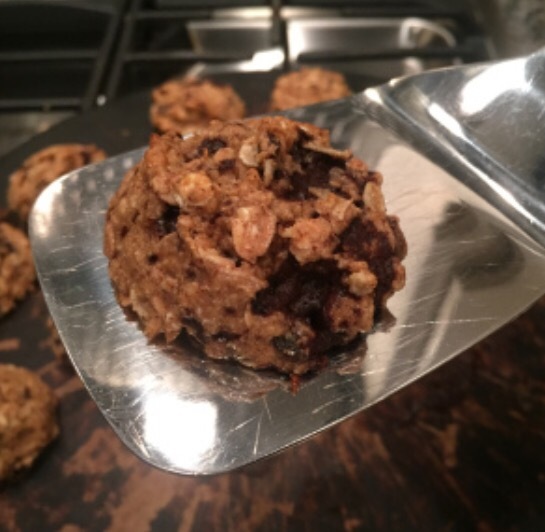 Chocolate Avocado Oatmeal Cookies – A creamy, eggless cookie option. Almond flour can be substituted for whole white wheat flour for a flourless option too. 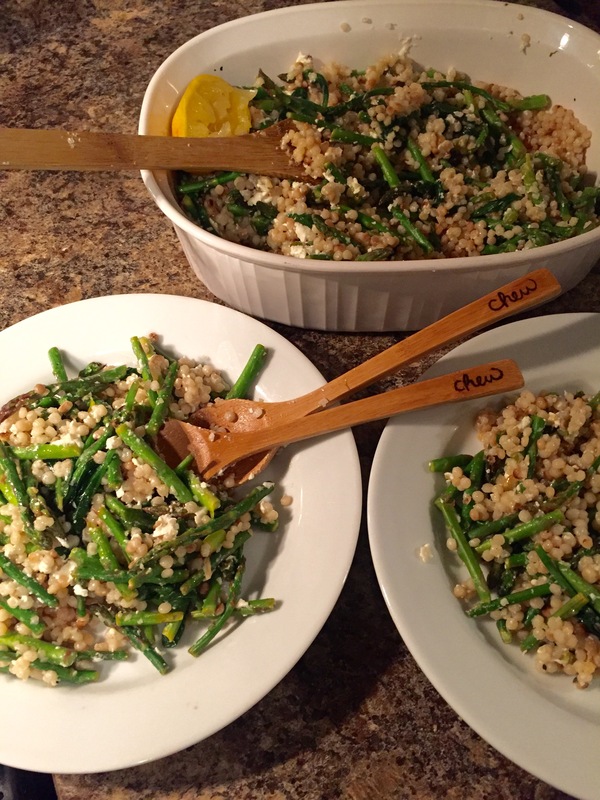 Couscous Lemon Salad with Spinach Feta and Asparagus – Easy, peasy, lemon and feta squeasy. Consider doubling this recipe – it makes for a great lunch the next day. 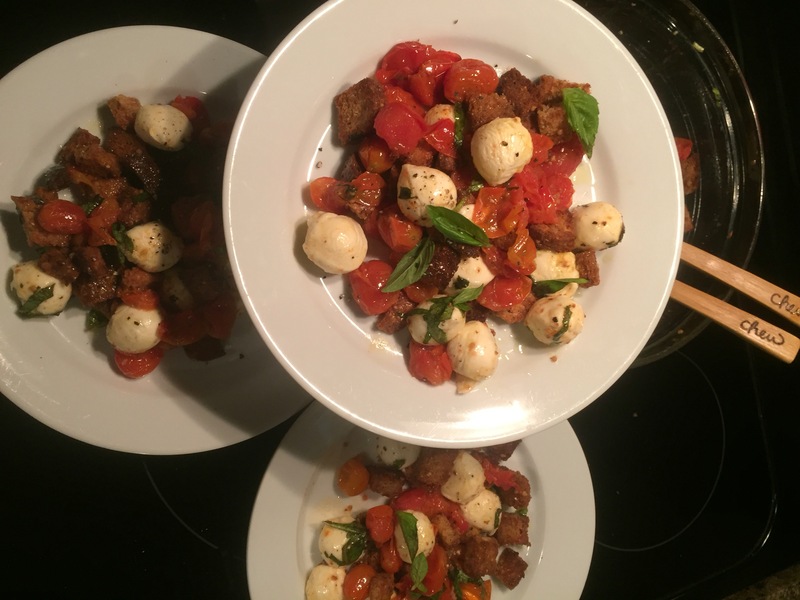 Roasted Tomato Caprese Panzanella – Some classics should not be changed. I felt that way about a caprese salad until I came across this recipe. Oh.my.goodness! The added crunch of toasted bread croutons with sweet balsamic vinegar takes this classic to a whole new level! 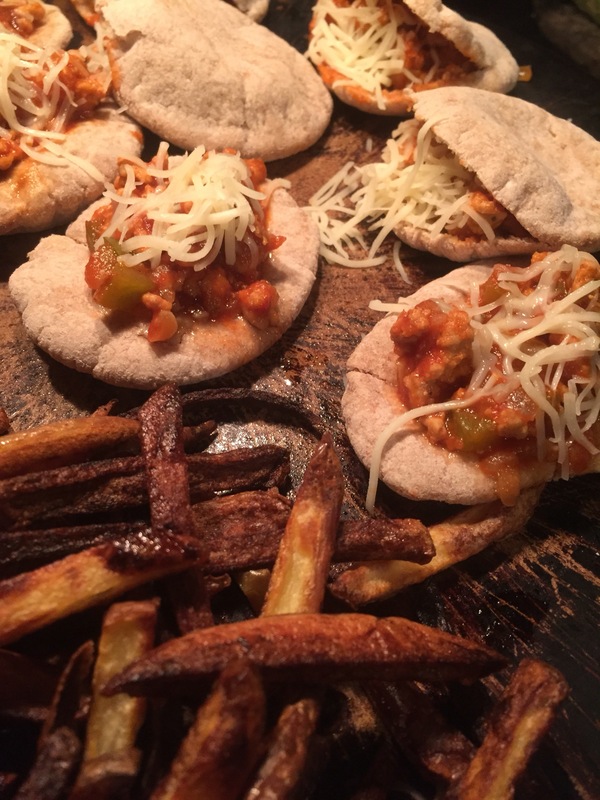 Clean Eating Sloppy Joe’s with Crispy Baked Fries – A crowd pleasing, comfort food staple that will be consumed with smiles. 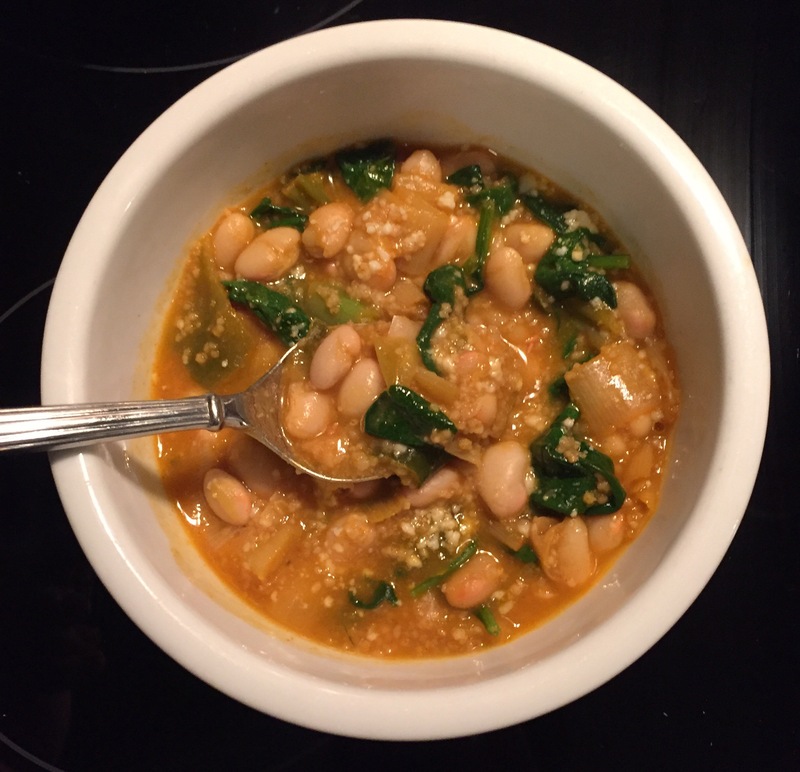 Broccoli Spinach Quinoa Soup – Did you know the entire head of broccoli, including the stem, is edible? Talk about zero waste cooking! (Smartphone users: scroll to the bottom of the screen to sign up for weekly recipe emails from We Eat For Real). Directions: Preheat the oven to 350 degrees. Grease a 9 x 9 baking dish with coconut oil and/or olive oil. In a small bowl, stir together the dry ingredients. In a larger bowl, whisk together the wet ingredients. Add the dry ingredients to the wet ingredients and stir just until combined (do NOT over stir). Very gently stir in the blueberries or gently press them into the top of the batter, being careful not to crush the blueberries. Pour the mixture into the baking dish. Bake for approximately 25 minutes and a toothpick inserted in the center comes out clean/dry. Directions: Preheat the oven to 350 degrees. In a small bowl, mash together the banana and avocado. Stir in the almond butter, stevia, and coconut palm sugar (if using). Stir in the remaining dry ingredients. Create cookie mounds using a scoop. Bake on a silicone lined baking sheet or baking stone for 15 to 17 minutes. Directions: Cook couscous according to package directions in salted water. Drain when done (reserve a cup of the cooking water). While the couscous cooks, warm a skillet to near medium heat. Add olive oil and garlic. Cook until you can smell the garlic. Add the asparagus and saute for 5 minutes before adding the spinach. Stir until the spinach begins to wilt. Squeeze the lemon over the top and toss the asparagus mixture. To a large serving bowl, combine the cooked couscous, asparagus mixture and feta cheese. Add 1/2 cup or more of the couscous cooking water and stir to create a bit of a sauce. Season with salt and pepper and give a final squeeze of lemon. Serve immediately. Directions: Preheat oven to 375 degrees (bake, not convection). Arrange the tomatoes and bread cubes in a single layer on two separate baking sheets. Drizzle each with 2 tablespoons of olive oil and ½ t. sea salt. Bake for ten minutes, use a spatula to flip the bread cubes, and return to the oven for an additional 10 minutes. 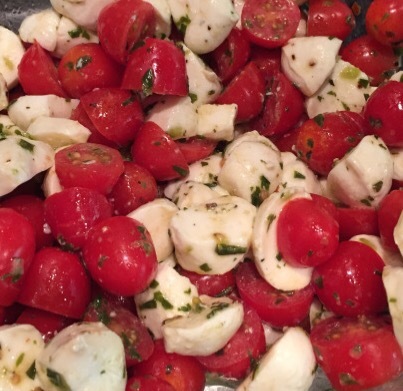 In a large serving bowl, toss the bread cubes, mozzarella balls, basil. Add the tomatoes and gently toss one more time. Drizzle desired amount of balsamic reduction and a bit more olive oil. Directions: In a small sauce pan, add the balsamic vinegar and stevia. Bring to a boil and immediately reduce to a simmer. Allow to simmer until it has reduced by one-half (about 30 minutes), stirring occasionally. It’s done when it is thick enough to coat a wooden spoon. Note: it will thicken even more as it cools. Refrigerate any leftovers. **These three ingredients can be replaced with Worcestershire sauce. Directions: In a large, deep skillet warmed to medium heat, add the olive oil, onions, and bell pepper. Cook until the veggies are softened (about 3-4 minutes). Add the garlic and cook another minute. Add the turkey and break it up into tiny pieces. Cook until no longer pink (about 5-7 minutes). Stir in the remaining ingredients and bring to a boil. Reduce heat to a simmer to allow the liquid to reduce and thicken a bit (about 5 more minutes). Serve immediately. Directions: Soak the fries in a large bowl of cold water for 15-20 minutes. While they soak, preheat the oven to 450 degrees (bake, not convection). Drain the fries and gently pat dry. In a bowl, gently toss the fries in olive oil. Arrange the fries in a single layer on a baking sheet. Sprinkle with sea salt. Bake for 25 minutes or until brown (flip at the halfway point). Directions: In a large stock pot heated to near medium, add the olive to coat the bottom. Add the onion, sea salt, and black pepper. Saute until softened (about 8 minutes). Add the uncooked quinoa and garlic. Stir constantly to brown the quinoa just a bit and prevent the garlic from sticking. Add the broth, broccoli, and potato. Bring to a boil and reduce to a simmer. Cover and cook for 30-35 minutes (the potatoes will be soft). Add the spinach and stir until it has wilted. Add the remaining ingredients. Transfer to a blender container (all or in batches depending on the size of the container). Blend until smooth and creamy. If your blender has a soup setting, use it and walk away. Top individual bowls with a dollop of Greek yogurt for a nice zip! 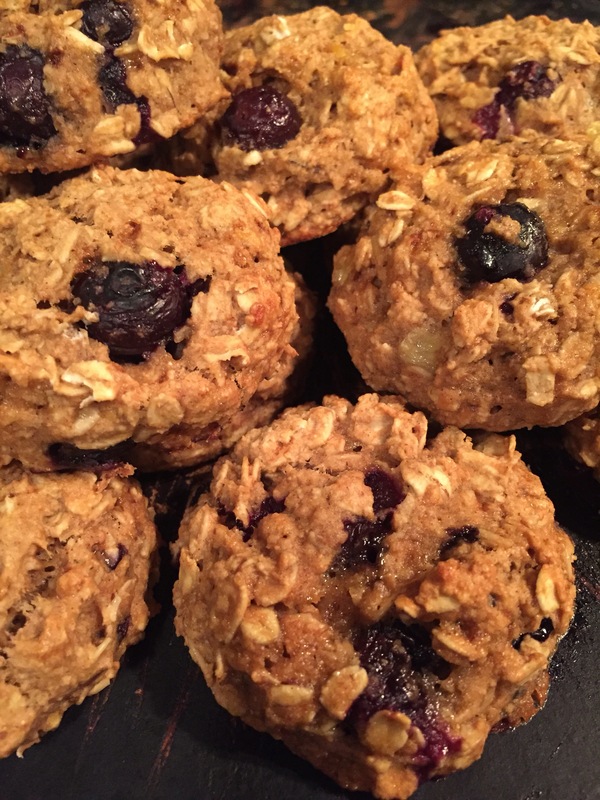 Blueberry Oatmeal Breakfast Cookies – These are “kitchen pantry cookies.” With lots of optional add-ins, you can throw in whatever is in the pantry. Consider chocolate chunks, nuts, raisins, etc. I added some extra honey because my bananas were nowhere near ripe. If your bananas are super soft and ripe, reducation the honey. 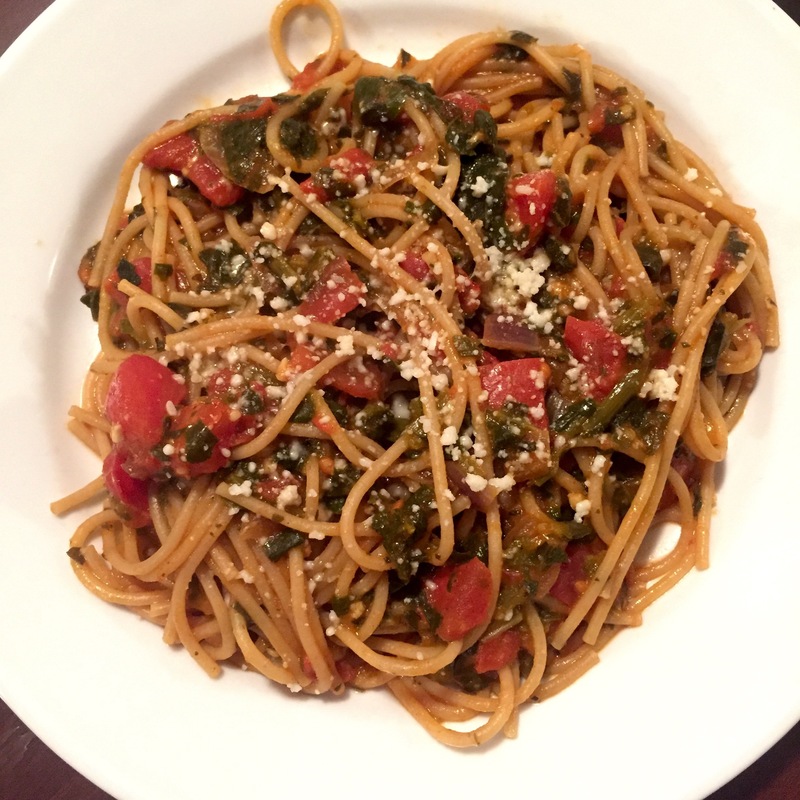 Kale Pesto and Ricotta Spaghetti – This is such a fast, easy and incredibly flavorful dish that I cannot get enough of! 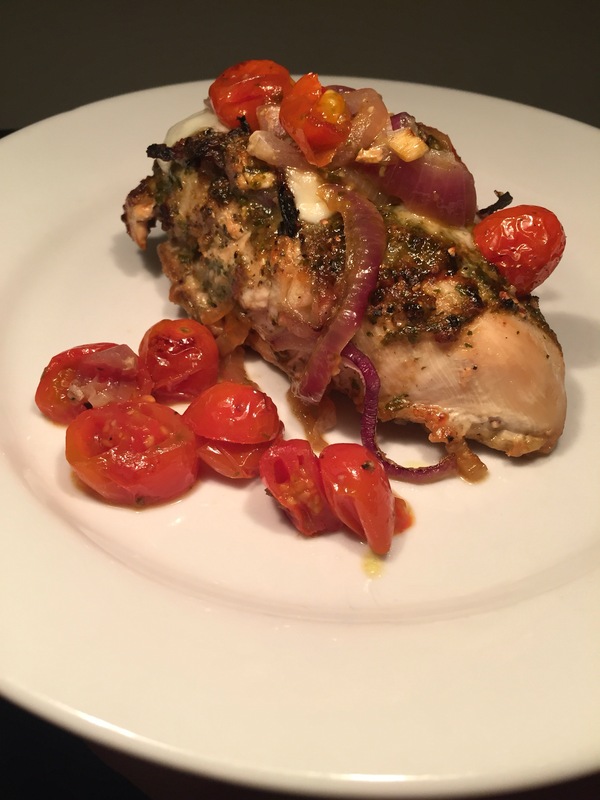 Balsamic Vinegar Chicken with Fresh Tomatoes – Pan sear some chicken and onions and then throw them, and a few other ingredients, in a baking dish. A super flavorful dinner is ready in no time. Minimal preparation makes this an ideal weeknight meal. 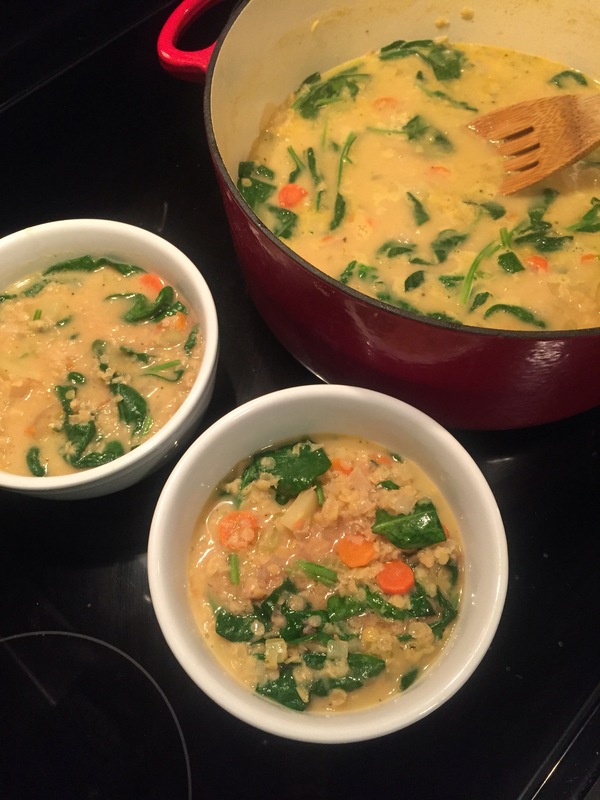 Creamy Spinach Lentil Soup – If you like easy, this soup is for you. Everything happens in a one stock pot. Talk about a flavorful, creamy soup option with tons of health benefits too. A perfect option for a cold winter weeknight. Note: I added the full amount honey to this batch because my bananas were nowhere near ripe. If your bananas are super soft and ripe, omit the honey. Directions: Prepare the pesto in a food processor. Add all ingredients, pulsing until combined (but not pureed). Season with sea salt to taste. Cook pasta in salted water. Drain the pasta and return it to the pot in which it was cooked (off heat). Stir the pesto into the hot pasta. 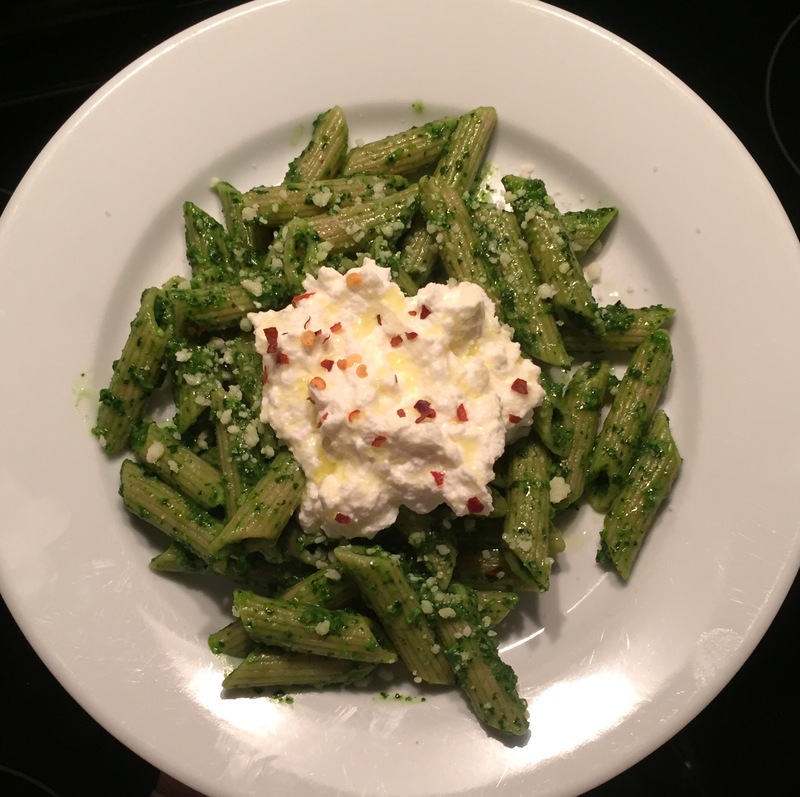 Plate and top with a generous dollop of ricotta. Sprinkle with sea salt, a few red pepper flakes, and drizzle with olive oil. If you like things spicy, add a bit more red pepper flakes. Directions: Warm a skillet to medium heat. Season both sides of the chicken with salt/pepper and a few dashes of Trader Joe’s 21 Seasoning Salute to each side. Add olive oil to the skillet. Sear the chicken for about 4 minutes on each side to lock in the juices. Note: The chicken will not be fully cooked at this point. It will finish cooking in the oven. After flipping the chicken, add the red onion to the skillet in the areas the chicken isn’t. While the chicken is searing, prepare the basil sauce in a blender or food processor. Puree the basil sauce ingredients (garlic cloves, basil leaves, balsamic vinegar, water, Parmesan cheese, and salt/pepper). Line a lasagna pan with foil. Add the seared chicken. Pour the basil sauce over the chicken. Next, add the onions, mushrooms, and finally the tomatoes. Bake uncovered for 30 to 40 minutes, or until the chicken is fully cooked. During the last 5 minutes of baking, top with the mozzarella cheese. Finish each serving with a drizzling of olive oil and freshly chopped basil. Directions: Heat a large stock pot to near medium heat. Add olive oil to coat the bottom of the pot. Add the onion, carrots, celery, and sea salt/pepper. Stir occasionally. Sauté until the vegetables have softened (about 8 minutes). Add the remaining ingredients (with the exception of the spinach). Bring to a boil and then reduce to a simmer. Simmer for 30 minutes. Check the liquid levels often, adding additional broth to keep the lentils covered by the broth. Add the spinach and stir until it has wilted. Season with additional sea salt/pepper to taste. Prior to serving, add a drizzle of olive oil and a scant teaspoon of red wine vinegar to each bowl of soup. Blender Banana Muffins – A fast muffin-like recipe that is a great on-the-go breakfast or after dinner treat. I say “muffin-like” because they look like muffins, but their texture is not light and crumbly. Instead, they have a spongy angel-food like texture. Tip: don’t over blend to prevent overly tough and chewy muffins. 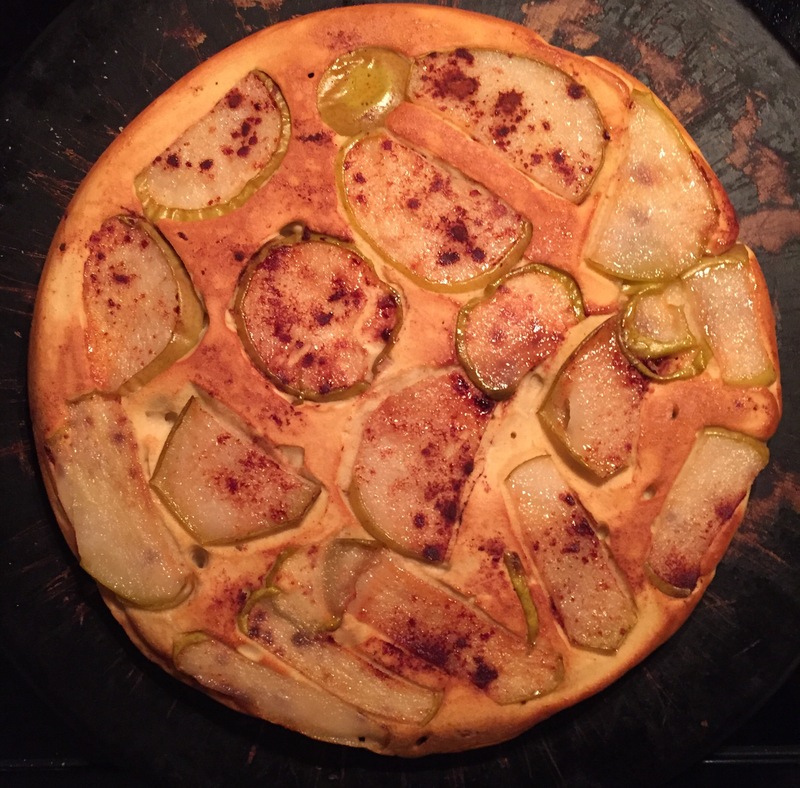 Pear Apple Oven Pancakes – Impress your friends with this upside down fruit pancake. Pears and apples cooked in cinnamon and honey make for a delicious breakfast for dinner meal. Easy Caprese Salad – Talk about fast, simple, and delicious. Add some grilled chicken and an impressive dinner is ready in no time. 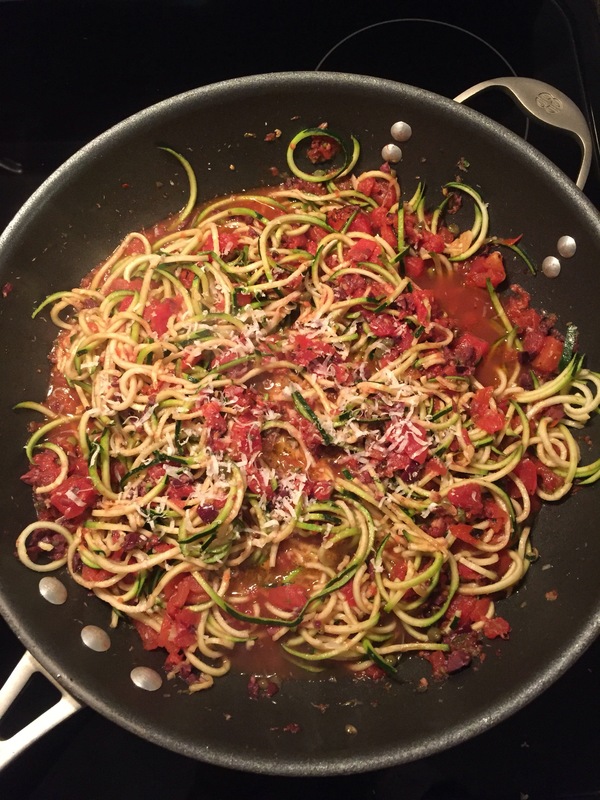 Zoodles Puttanesca – Don’t like zoodles (a.k.a. zucchini pasta)? No worries. Use whole wheat pasta instead. Whatever you do, you won’t be sorry. This sauce is killer! Don’t be scared of the anchovies. They melt into the olive oil, and the recipe just isn’t the same without them!! Broccoli and Cheese Baked Spaghetti Squash – “Mom, you know I don’t like spaghetti squash!” “Oh wait, maybe I do like it with broccoli and cheese.” You’ll feel the same way, trust me. Directions: Preheat oven to 375 degrees. To a blender container, add all ingredients in the order listed (except the chocolate). Blend for about 15-20 seconds. Do not over blend. Add the chocolate and give it a quick pulse. Alternatively, pour the batter into olive oil greased muffin tins; and sprinkle the chocolate chunks atop each muffin cup. Bake for 15 to 18 minutes or until sightly golden. Allow to cool completely before removing. Directions: Preheat the oven 375 degrees. To the blender, add the first six ingredients (eggs, vanilla, honey, flour, baking powder, and sea salt). Turn on medium speed for 15 seconds. Heat a nonstick to near medium heat. Add the butter to coat the bottom of the pan. Arrange the pears and apples evenly on the bottom of the skillet. Evenly sprinkle the cinnamon the on the fruit and drizzle with the honey. Sauté for approximately 5 minutes or until the fruit begins to soften, stirring gently once or twice. Pour the pancake batter evenly atop the fruit. Once the batter begins to set up on the bottom of the skillet (approximately 5 minutes), insert the skillet to the oven. Bake for approximately 8 minutes or until the top has set up and is slightly golden. Carefully remove the skillet from the oven. Cover the skillet with a plate slightly larger than the skillet. Invert it to reveal the sliced pears and apples. Serve with warmed maple syrup. Directions: In a small sauce pan, add the balsamic vinegar and stevia. Bring to a boil and immediately reduce to a simmer. Allow to simmer until it has reduced by one-half (about 30 minutes), stirring occasionally. It’s done when it is thick enough to coat a wooden spoon. Directions: Use a spiralizer tool to create zucchini noodles (a.k.a. zoodles). Set them aside. Warm a large skillet to just below medium heat. Add enough olive oil to coat the bottom of the skillet. Add the minced garlic, and allow it to sizzle for 30 seconds. Next, add the anchovies to the oil. Don’t worry; you won’t have to look at these guys for very long. They will dissolve and serve as flavor only for this amazing sauce. Finally, add the chili flakes that add both flavor and heat to the oil. Give everything a stir. While the sauce bubbles at the edges and smells up the kitchen something fiercely delicious, give the olives and capers a rough chop before adding them to the skillet. Finally, stir in the final ingredient – canned tomatoes. Adjust your skillet heat so that a little bit of simmering is happening to marry all the flavors. Using tongs, add the zoodles to the sauce. Toss them to evenly heat and coat them with the sauce. Once plated, drizzle with olive oil and Parmesan cheese! Directions: Microwave the whole spaghetti squash for 2 minutes. Slice lengthwise to create to long boats. Place face down on a microwave safe container with a small lip. Add 1 tablespoon of water to the plate and cover with plastic wrap. Cook for 12 to 15 minutes or until the flesh is very soft when pushed. In the meantime, add olive oil to a skillet warmed to nearly medium heat. Add the red pepper flakes, garlic, and broccoli florets. Cook for 2 minutes, stirring frequently. Increase the temperature to medium add 2 tablespoons of water. Put a lid (or inverted plate) on the skillet to allow the broccoli to steam until soften slightly (3 to 5 minutes). Remove the broccoli from the heat and place in a mixing bowl. Use a fork to scrape the spaghetti squash in the bowl with the broccoli. Stir in the cheeses, Italian seasoning, and sea salt/pepper. Evenly divide the mixture among the spaghetti squash ‘boats.’ Broil on the lowest oven rack until the cheese is bubbly and browning ever so slightly. 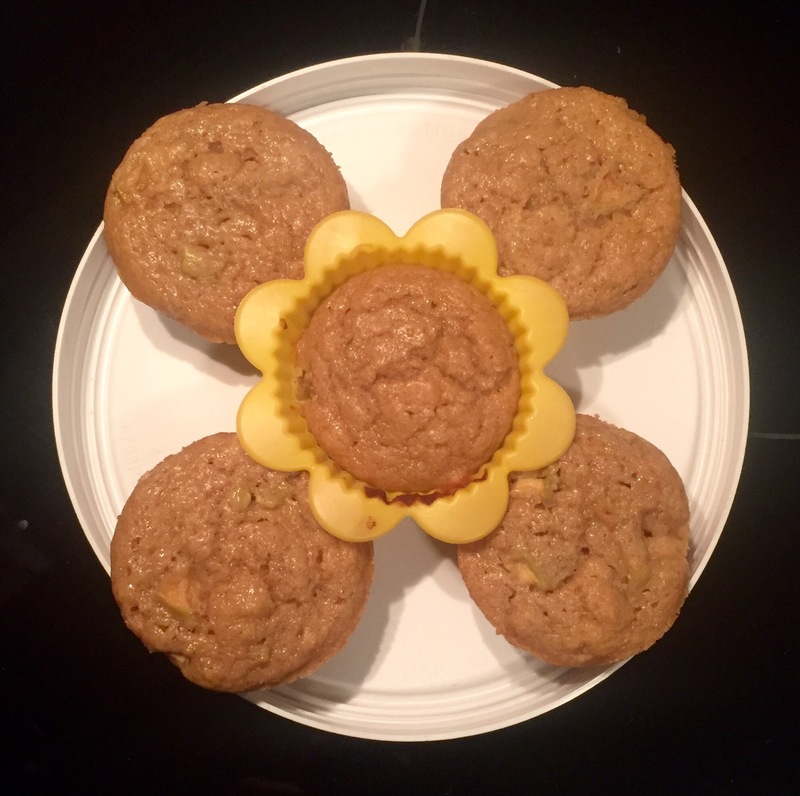 Apple Applesauce Muffins – This is quite possibly one of the best apple muffin recipes. Applesauce and diced apples make for a super moist and sweet muffin. The subtle cinnamon and vanilla are delicious extras that can be included, or not. Butternut Squash Soup & Cleaned Up Monte Cristos – I used an alternative to a whole butternut squash – bagged, pre-cubed butternut squash. This smooth and creamy soup, with hints of wintery seasonings, pairs beautifully with a fun spin on a Monte Cristo. Instead of deep frying, this cleaned up Cristo is prepared like a pan “grilled” cheese sandwich. 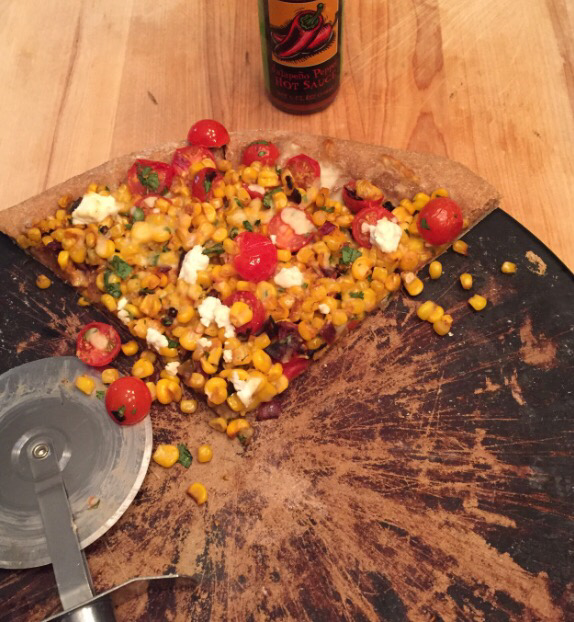 Corn and Tomato Pizza With Cilantro and Goat Cheese – This a family requested favorite. It’s likely my daughter’s favorite pizza of all time! Directions: Preheat the oven to 350 degrees. I use silicone muffin cups. If using a metal muffin pan, lightly grease with a clean oil (ideas: olive oil, coconut oil, avocado oil). In a small bowl, combine the dry ingredients. In a larger bowl, whisk together the wet ingredients. Add the dry ingredients to the wet ingredients and stir just until combined. Very gently, stir in the apples. Fill muffin containers ¾ full and bake approximately 15 minutes. Mix/stir as little as possible to create fluffy, moist muffins. I don’t like the toothpick test for muffins as I find they are often overdone. Remember, they continue to cook a bit even when removed from the oven. Instead, watch for them to begin to release from the edge of the baking cup/tin and for a slightly golden color. Once you’ve baked a few batches, you’ll begin to learn your oven’s ideal baking time. Directions: Stir together both ingredients in a small bowl and allow rest for 5 minutes. Directions: Warm a non-stick skillet to medium heat. Season all sides of the chicken with salt, pepper, and paprika. To the skillet, add the olive oil and chicken. Cook until the chicken is browned on all slides (about 5-6 minutes). Add onions and green peers, cooking until the peppers are softened. Add the garlic and cook until fragrant (about a minute). Immediately add all remaining ingredients. The tomatoes will sizzle in the skillet. Reduce heat to a simmer. Allow some liquid to cook out (about 10 minutes). Season with salt/pepper to taste. 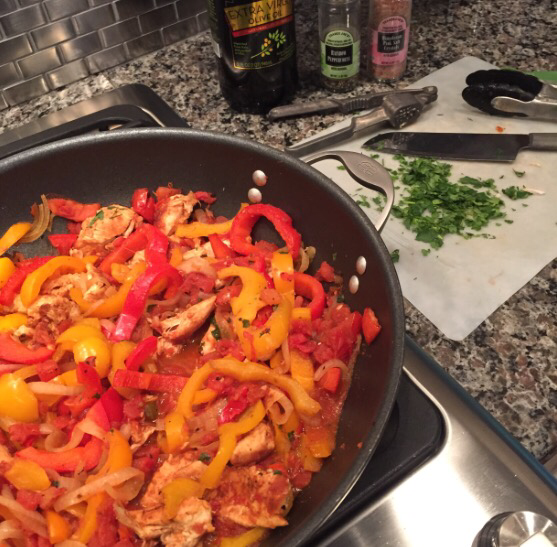 Serve fajita mixture with whole wheat tortillas and your favorite fajita fillers. Directions: In a shallow dish, whisk together the eggs, sea salt/pepper, milk and cayenne. Separate the turkey slices and sprinkle with oregano. Assemble the sandwiches: thin layer of Dijon mustard on each slice of bread, cheese slice, turkey, a layer spinach leaves, another slice of cheese, and bread. Heat a large skillet to near medium heat. Place sandwich on a slotted spatula. Lower the sandwich into the egg mixture – deep enough that the egg mixture reaches one-half of the way up the slice of bread. (Be careful that the egg mixture does NOT “enter” the interior of the sandwich). Raise the sandwich from the egg mixture. Place your hand on top of the sandwich. Press down to compact the sandwich just a bit. Carefully and quickly invert the sandwich from the spatula to your hand. Transfer the inverted sandwich from your hand to the spatula. Again, lower the sandwich into the egg mixture on the dry side to finish coating the sandwich. Add olive oil or butter to the skillet Prepare sandwich as you would any other pan “grilled” sandwich. Directions: Preheat the oven to required pizza dough temperature. In a medium/large skillet warmed to medium heat, add the olive oil and onion and jalapeno (if using). Sauté until onions are translucent (about 5-7 minutes). Add the corn and sauté another 5 minutes. The next step happens quickly because you do not want to burn the garlic! Add the garlic, stirring constantly, allowing it to cook for about a minute or until you can really smell it. Immediately squeeze the lemon over the skillet. Stir in the cilantro and the cherry tomatoes. The heat will help the tomatoes to release their juices (about 5 minutes). Remove from the heat. With the dough on the pizza stone or baking sheet, add a thin layer of mozzarella cheese, followed by the corn mixture. Crumble the goat cheese atop the pizza and add the remaining mozzarella cheese. Bake according to your pizza crust directions. This is amazing – especially with a few drops of hot sauce on each slice!!! Directions: To a heated stock pot, add the olive oil. Stir in the leeks, salt, pepper, cumin, and paprika. Saute leeks until softened (about 8 to 10 minutes). Add the garlic and cook until fragrant (about 1 – 2 minutes). Add the beans, broth and bay leaves. Bring to a boil and then reduce to a simmer and cook for 10 minutes. Add the couscous and cook another 5 minutes. Stir in the spinach leaves. Season to taste (another ½ t. sea salt or more is likely needed). Enjoy topped with grated Parmesan cheese. Refrigerate leftovers. Day 2: Puree soup leftovers in a blender. If using a Vitamix, you can blend on high until steaming at the lid (or use the soup setting). Otherwise, warm the soup on the stove top or microwave. Why pizza when I can eat this!?! Salted Chocolate Oatmeal Raisin Cookies – Chewy, sweet, and a hint of salt. These are my all-time favorite cookies (that I make). Blueberry Muffins – Throw it all in the blender and bake. It’s quite possibly the easiest, non-traditional blueberry muffin/brownie recipe ever. 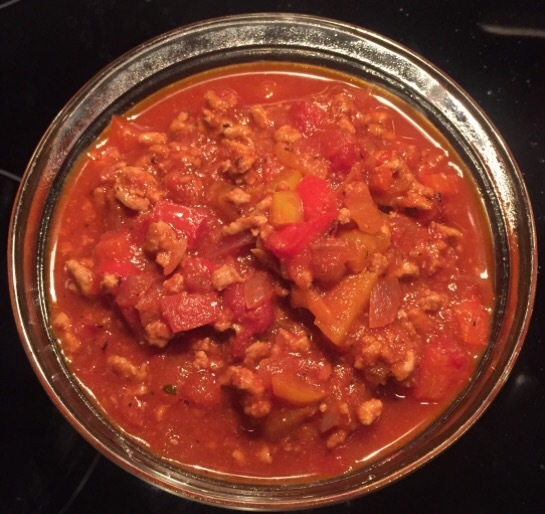 Indian Summer Chili – I will not apologize for this recipe’s appearance here, yet again. It’s just that great. My hubs would eat it every week, if I would agree to make it that often. You’d never guess it’s a turkey chili. 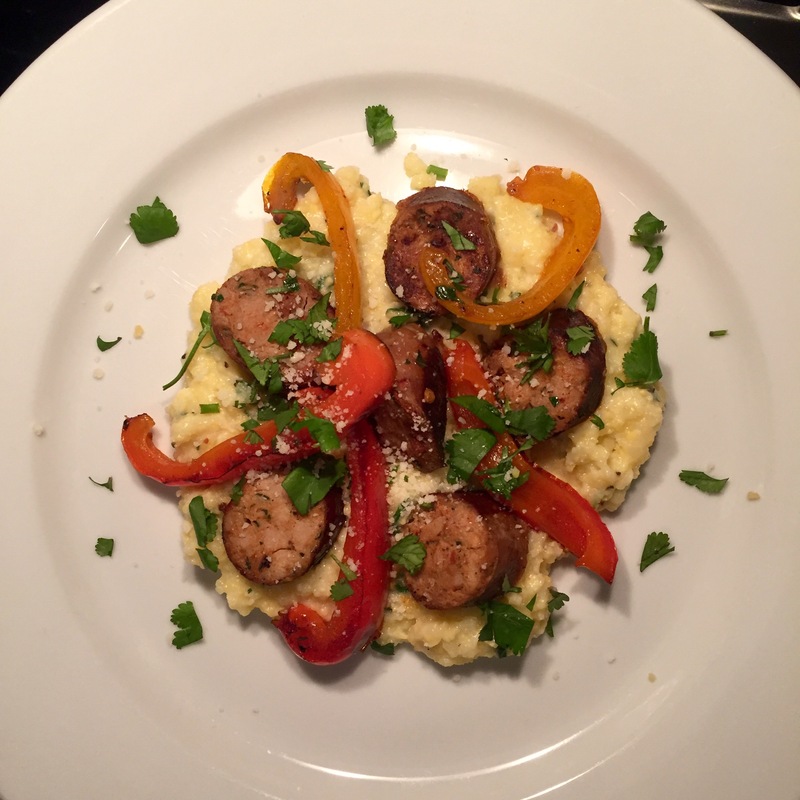 Cheesy Polenta with Bell Peppers & Chicken Sausage – Impress yourself and others with this incredibly easy and delicious dinner option. It looks and tastes like a high-end restaurant meal every. single. time. One Pot Pasta – Talk about easy. A stock pot is all you need to create this pasta. Start to finish…25 minutes. Yes, please. 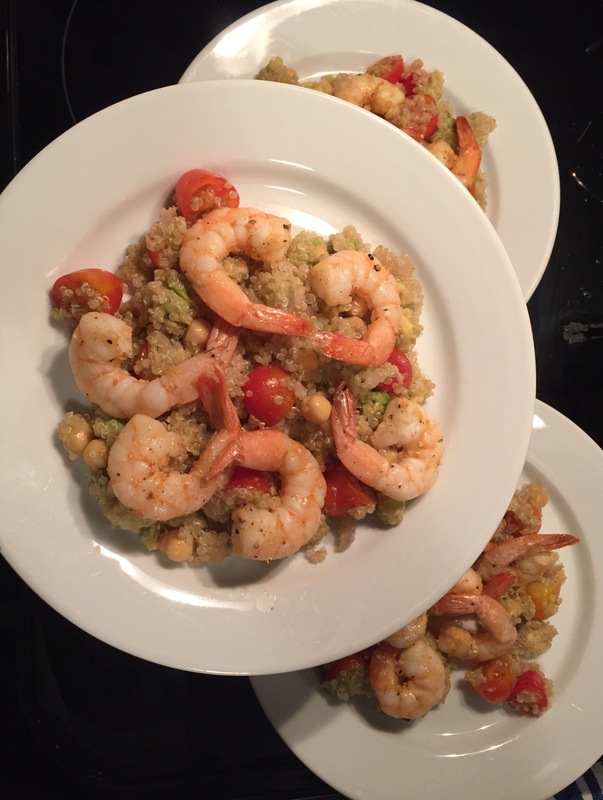 Spicy Grilled Shrimp with Quinoa Salad – I don’t know why I haven’t introduced you to this recipe sooner. When my little one took a bite, she said, “Why would I even think about pizza when I could eat this!” Note: I usually make this on weekends. It’s not hard, but there are a few more steps than some weeknights allow. It’s sooo worth it! 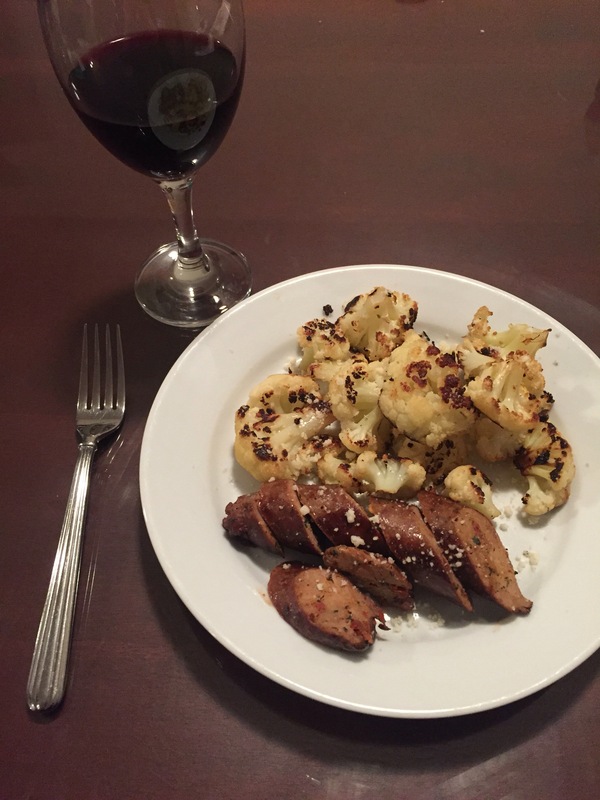 Pan Seared Chicken Sausage with Parmesan Roasted Cauliflower – Sometimes, two ingredients is all you have left in your refrigerator. There’s something to say about a stupidly simplistic meal that is incredibly flavorful. Roasting veggies is key to creating powerful flavors and textures that can really “make your tongue slap your brain” (as my father in law would say about fantastic food). Smartphone users: scroll to the bottom of the screen to sign up for weekly recipe emails from We Eat For Real. Directions: Preheat oven to 350 degrees. Combine dry ingredients in a bowl. Combine wet ingredients in another bowl. Add dry ingredients to wet ingredients and mix. Gently stir in chocolate & raisins. Scoop rounded tablespoon size servings onto a baking stone or lined cookie sheet. Cook 9 to 10 min. (Do not over cook. They will be soft and gooey, until they have cooled a bit). Allow to cool on the baking sheet/cooling stone. Makes approximately 16 cookies. Directions: Preheat oven to 350 degrees. In a heavy duty blender or food processor, add all ingredients except the blueberries. Blend until smooth and creamy. Stir in the blueberries by hand. 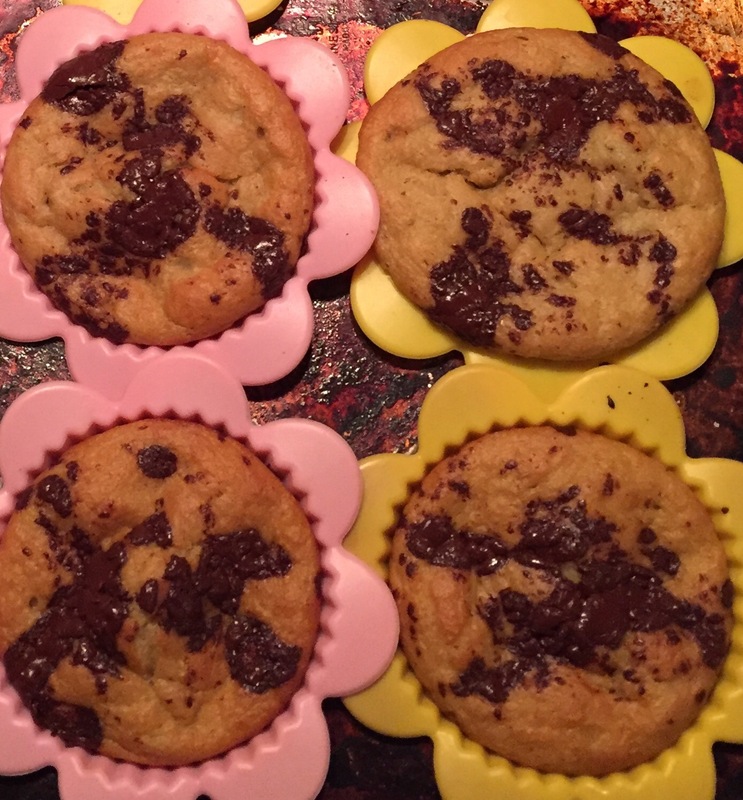 Fill silicone muffin cups (or greased muffin pan) ¾ full and bake 10 to 12 minutes. Allow to cool before removing from muffin cups/pan. Directions: Heat a large stock pot to medium heat. Add olive oil to coat the bottom of the pan. Add the turkey, chili powder, grill seasoning, cumin, Worcestershire sauce, and hot sauce. Stir the ingredients and break up the turkey into tiny bits. Continue cooking until the turkey is no longer pink (approx. 5-7 min.). Add the onions and green peppers, and cook until softened (about 5 min.). Add all other ingredients and bring to a boil. Immediately reduce heat to barely simmering. Cover and allow to simmer for at least 20 min. Directions: In a medium bowl, add all ingredients and stir to combine. Store unused BBQ sauce in the refrigerator, or freeze. Directions: Warm a small sauce pan to low/medium heat. Add the milk and polenta. Mash the polenta with a firm whisk or fork and then stir until creamy. Add milk by the tablespoon if it’s too thick. If it’s too watery, don’t worry. As it continues to cook, it will thicken. Reduce heat to low and stir in one-half of the cheese and one-half of the cilantro. Allow to rest on low. If your stove top burner is too hot on low and the bottom is sticking, remove it from the heat. (It can be warmed easily on low just before serving). While the polenta is resting, heat a large skillet to nearing medium heat. Add the olive oil and then sausage. Cook 5-6 minutes or until hot and slightly browned on all sides. (If using precooked sausage, you just need to get it hot). Remove the sausage from the pan (retaining the olive oil and juices) and cover it with foil to keep warm. Add ½ tablespoon of olive oil to the skillet and then the peppers. Add freshly cracked pepper and sea salt. Sear peppers in the skillet until softened and slightly blackened (about 5 minutes). Return the sausage to the skillet. To the polenta, stir in the remaining cheese and cilantro. Season polenta with salt/pepper to taste. To plate, add a generous helping of polenta. Top with the sausage and peppers. Finish with a sprinkling of cilantro. If you want to spice it up, add a few dashes of hot sauce! Directions: Heat a large stock pot to near medium heat. Add olive oil to coat the bottom of the pot. Add the onion and sea salt. Saute until translucent (3-4 minutes). Add the garlic, basil, oregano, red pepper flakes, and black pepper. Saute until the garlic is fragrant (about a minute). Add the remaining ingredients. Bring to a boil, reduce to a simmer, and cover with a lid. Simmer until the pasta is cooked (about 10 minutes). Serve topped with Parmesan cheese and a drizzle of olive oil. Step 1: In a medium bowl, whisk together the marinade (lime juice, chili powder, cumin, black pepper, hot pepper sauce, smoked paprika, garlic). Very gently toss the shrimp in the marinade. Cover and refrigerate. Step 2: Heat a sauce pan to near medium heat. Add the olive oil and onion. Saute until the onion is translucent (3-4 minutes). Stir in the garlic and quinoa. Toast the quinoa by stirring constantly for 2 minutes (it will begin to turn a slightly golden color). Add the water and bring to a boil. Reduce to a simmer and cover with a lid. Simmer for about 10 minutes (or until the liquid is gone). While it simmers, proceed to step 3. Step 3: Whisk together the lime juice, olive oil, cumin, salt, pepper and honey. Gently stir in the remaining ingredients. Add the cooked quinoa and stir. Step 4: Heat a large skillet to medium heat. Drain, (do not rinse) the shrimp. Sprinkle shrimp with sea salt. Add olive oil or butter to the pan. Arrange shrimp in a single layer in the skillet. Sauté (2 minutes), quickly flip with tongs, and allow to saute another 2 minutes. DO NOT OVERCOOK. Remove from the heat. Serve shrimp atop the quinoa mixture. Directions: Preheat oven to 425 (bake, NOT convection setting). In a large bowl, toss the florets, olive oil, salt/pepper, & garlic. Spread onto parchment or foil lined baking sheet. Roast the cauliflower for 20-30 minutes (flipping with a spatula half-way through roasting). It will be slightly browned and crispy on the edges. Remove from oven and top with Parmesan cheese and freshly squeezed lemon juice. While the cauliflower roasts, pan sear the chicken sausage on all sides until thoroughly cooked. 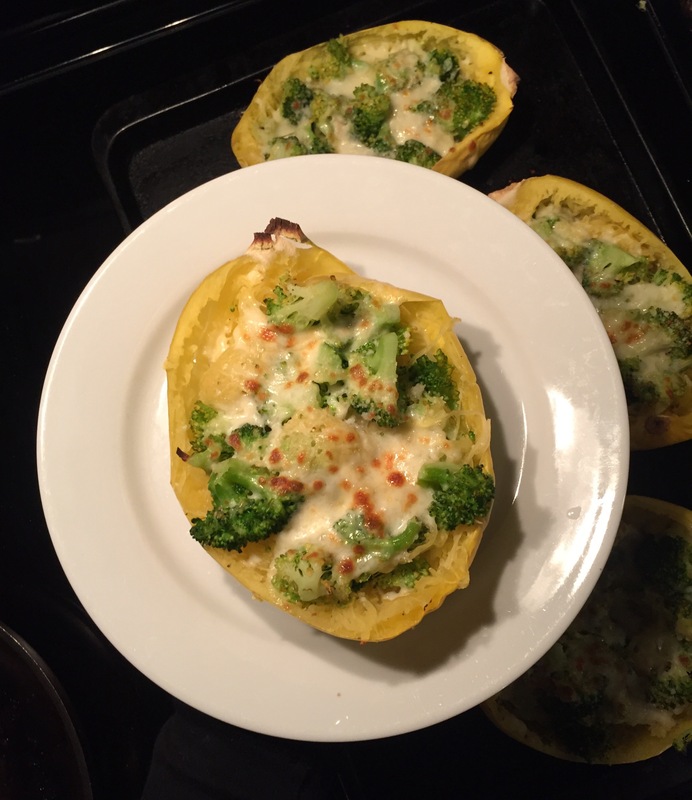 Stuff It To Impress…Peppers and Acorn Squash That Is. Dark Chocolate Pumpkin Cake Cookies – Despite the flat and unappealing appearance of this batch, they were yummy. “Why are they flat?” You may be wondering. Or, maybe you are like me and could care less as long as they are good. For those who do care, there are lots of reasons cookies end up flat. In my case, a warm baking stone was the culprit. I set the baking stone on the oven while preheating … oops. Chocolate Orange Avocado Pudding – What feels good on a strep ridden sore throat? Pudding! No, not store bought pudding laden with sugar, chemicals, and who knows what else??? A creamy homemade chocolate pudding with an orange juice kick. The avocado is undetectable from a taste standpoint; however, the creaminess is heavenly. Stuffed Acorn Squash with Organic Greens – Here’s another impressive option for entertaining – guests eat from individual squash bowls. The organic greens make a perfect side. The original recipe calls for ground turkey. This time, I made it with bacon. Outcome: great success! Roasted Tomato Soup with Oven Baked Caprese Grilled Cheese Sandwiches – Yep, you’ve seen these recipes here before. This is an easy go to meal that tastes like someone slaved in the kitchen when it’s quite the opposite. And the sandwiches…oh my! The roasted tomatoes, stolen from the soup recipe, take these to a whole new level. Turkey burgers, Brussels sprouts, broccoli, and zucchini noodles have bad reputations because they’ve tasted horrible or they have a notorious history. Either way, many refuse to give these ingredients a shot. Here are some new ways to prepare these ingredients that will result in happy taste buds. Banana Cake Cookies – We couldn’t wait on these to cool before tasting because they smelled so good! Slather with a bit of almond butter for another layer of deliciousness!! Greek Turkey Burgers with Tzatziki Sauce & Creamy Coleslaw – A staple meal in our house. In my experience, traditional grocery stores tend to carry ground turkey that is gamey and less than appetizing. Opt for a higher quality ground turkey, ideally organic, to allow the feta and olive to take center stage. If you are in a rush, skip the tzatziki sauce and top your burgers with coleslaw. While a different flavor altogether, it gives it a delicious creamy crunch that hits the spot too! Brussels Sprouts Cranberry Quinoa Salad & Chicken Sausage – I know, I know, you “hate” Brussels Sprouts. This time, they are shredded and served as salad greens. That traditional overcooked, stinky, and mushy thing is nonexistent. My original intent was to serve the chicken sausage on the side. However, at the last minute, I decided to slice it and throw it in the salad. Outcome: Great success. Pan Seared Chicken with Lemon & Garlic Roasted Broccoli – Start with a good quality organic chicken breast, pound it out so it’s even, season it well, and presto! Served with roasted broccoli that is slightly crunchy and garlicky with a hint of lemon and cheese and dinner is ready in a flash. Lemon Zoodles with Artichokes & Chicken Sausage ­– Zucchini should be organic if it’s to be eaten. That didn’t happen this week b/c the grocery store didn’t have any. So, I used non-organic zucchini [the horror, I know!!] I don’t make a habit of it, but on occasion, it happens. As for the recipe itself, within two bites, the hubs requested that it “be on the rotation.” My little, one who typically despises zoodles, agreed. That is sayin’ something.